For a long time Cairo's Giza half was perhaps best known for its Pyramids, its University and its Zoo. Except for the last third of this century, the three were intervisible in a predominantly green setting. Generations of Cairenes loved to brag theirs was the fourth best zoo in the world. In recent years, however, ever since the recession of the '60s and the infitah of the '70s, Giza began to transform itself into a concrete jungle. By the year 2,000, the zoo, which celebrated its centennial three years ago, may be all that is left of what was once Cairo's fertile hinterland. 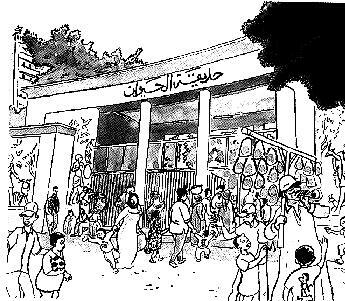 Cairo's zoo was a legacy from Khedive Ismail. Originally, it occupied 50.4 feddans, once part of the Harem Gardens or "gardens of delight" as it was then called by its bondaged inhabitants. Whether it was in his quest to green Cairo or to awe his beautiful Circassian concubines, Ismail imported into Egypt one of the finest collection of flowers, exotic plants and trees from India, Central Africa and South America. A survivor is the zoo's giant banyan planted around 1871. As for the collection of animals that came to form the backbone of the zoo, this was laid on the foundation of Ismail's private menagerie. In the latter 1870s, the palace and gardens passed on to the state in partial settlement of the khedive's accumulated debts. As of 14 January 1890, the Harem Building was used as a museum for Egyptian treasures and antiquities up until the present museum on Tahrir Square was opened in 1902. And while the southern portion of the Salamlik Garden fronting the Nile was sold to the public many of whom built stately homes, the Harem Gardens were kept intact. Some of wonders of the Harem Garden included roads paved with black stone flags imported from Trieste. There were the extraordinary footpaths worked in pebbles looking like sugar coated almonds laid out in Arabesque and Roman mosaic. There was the idyllic pond with a marble island in its center which later became the zoo's Tea Island where so many notables and their consorts spent stolen moments. Another Harem Garden heirloom were the giant ferns. These were in evidence everywhere under the shade of the large trees. The Garden was ornamented with several grottoes while on its every knoll stood a lookout kiosk. There were miniature winding canals studded with a fine collection of water plants under which swam the khedive's salmon trout. The canals were spanned by rustic bridges of various workmanship with velvet covered handrails so as not to hurt the delicate fingers of the khedive's harem. A crossings that stood out from the rest joining two towering artificial hills was the light suspension bridge built by Alexandre-Gustave Eiffel and brought to Cairo when Ismail visited the Paris Exhibition. According to contemporary eyewitnesses, the flora that adorned the Harem Gardens was more than sufficient as a stand-alone attraction, and the suggestion of adding fauna for the creation of a Zoo was absolutely redundant and unnecessary. Cages would disfigure the gardens, complained the animal rights advocates. Cairo's sub-tropical climate while ideal for plants and trees, was most unsuitable for the four-legged inmates - far too warm! 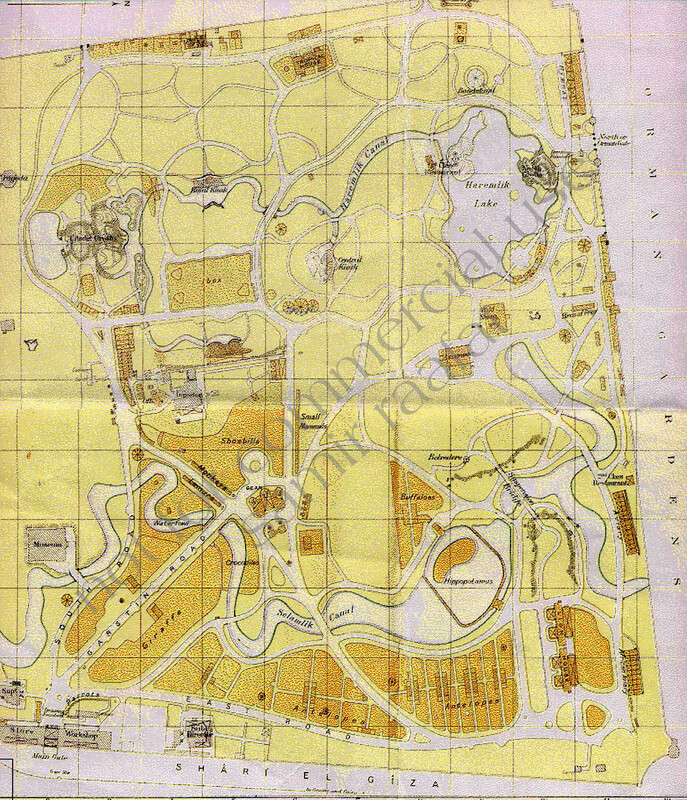 The responsibility of laying out the Zoo between 1891-1901 was given to a Mr. A.R. Birdwood (no pun intended). By 1900 the annual cost of the Zoo had reached L.E. 1,600 of which L.E. 1,000 was a grant from the government and the remainder derived from private donations. Captain Stanley S. Flower who was responsible for the animals was appointed the Zoological Garden's first director, a post which he occupied until 1924. Each year, in concurrence with the zoo's prestigious board of trustees, Flower submitted to the government his celebrated 'state of the Zoo report.' The report was reproduced in the local papers to be scrutinized by nature lovers and wildlife supporters forever eager to learn what new plant or animal had been imported. By the end of World War II the zoo boasted 4,700 exhibits including 3,500 birds, 700 mammals and 500 reptiles, a far cry from Khedive Ismail's original menagerie of 78 vertebrate and 180 feathered creatures. Gradually, the zoo's inmates increased with a tiny percentage entering this world from within the zoo itself such as the two Kudus born in 1907 making them the first ever to be bred in captivity. As new animals arrived - some to stay, others in transit on their way to other zoos - old inmates died of natural causes, epidemics or heat apoplexy's. The bulk of the animals however, continued to be imported from different parts of Africa and Asia. The number of human visitors to the zoo kept climbing. In 1899, the visitors amounted to 43,567 yet by 1906, these had increased fivefold to 223,525. 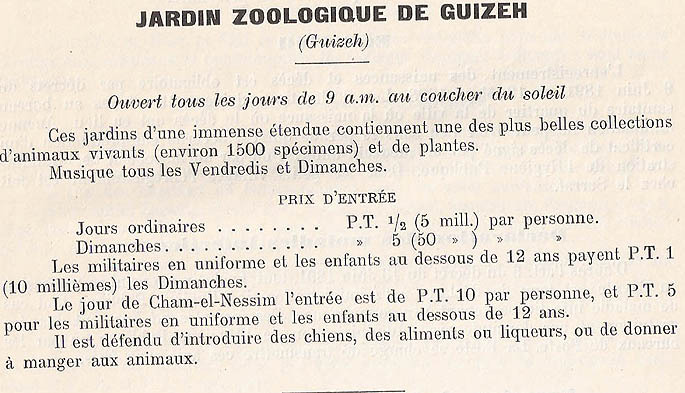 Zoo attendance climbed in proportion to Cairo's burgeoning population. Feast days and certain public holidays would result in record highs sometimes to the detriment of the annoyed animals and their keepers. To this day, and despite its neglected state, Khedive Ismail's former Harem Gardens continues to draw record attendance on any given public holiday. The way things are going, it will be a great sorrow indeed if the maimed Giza zoo becomes the last refuge in Egypt where one can glimpse wild fauna and exotic flora.